Our expert stylists will come to you to make your day even more special. Want to create a certain look? Elloise India Weddings Hair and Makeup: mobile wedding hairdressers and makeup artists bringing a luxury Wedding Hair and Makeup service to your ceremony … Let us help you create your perfect wedding day with hair & makeup you’ll love! At Elloise India Weddings Hair and Makeup, we are passionate about what we do: We pride ourselves in providing you with a very personal service so that you have an amazing wedding day experience! We are here to offer you a professional mobile wedding hair and makeup service, working in and around Southern counties to include Central London, South East and South West of England. Our highly skilled wedding hair and makeup team will come to your wedding day, to give you, your bridesmaids and your family the perfect hair and makeup. We cover London, Swindon, East Sussex, West Sussex, Surrey, Kent, Hampshire, Berkshire, Dorset, Essex, Somerset. 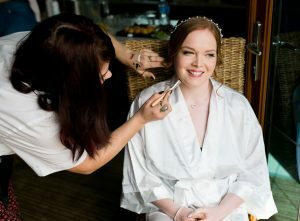 Every bride is unique and wants to achieve a natural effortless beauty on her wedding day. She wants to be radiant, feminine and feel the confidence that comes from within. Our team uses their unique experience to explore a wide range of possibilities, allowing you to choose a style and image which makes you feel elegant and sophisticated. We embrace the experience of working with the entire wedding party and take pleasure in including your bridesmaids, flower girls and the mother of the bride on this special day. If you’d like to see a little more information (and maybe find that perfect venue on your doorstep) you can click on the map link above and see our Google places map of where we’ve worked. Or, see our top-10 wedding location picks here.